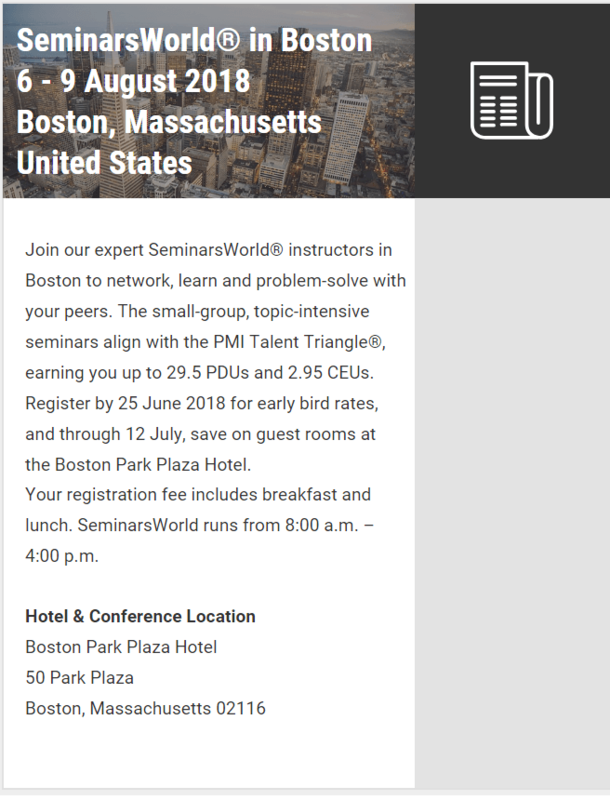 Join our expert SeminarsWorld in Boston to network and learn with your peers in small-group, topic-intensive seminars aligned with the PMI Talent Triangle®, while you earn up to 29.5 PDUs and 2.95 Continuing Education Units (CEUs). Register by 25 June 2018 for early bird rates, and through 12 July, save on guest rooms at the Boston Park Plaza Hotel. Seminar registration includes breakfast and lunch. SeminarsWorld runs from 8:00 a.m. – 4:00 p.m.
Make reservations early, as rooms tend to sell out quickly. Call the hotel directly at +1 617 426 2000 to make a reservation. Be sure to mention Project Management Institute to receive the SeminarsWorld rate. For online reservations, click on the “book your room” button. PMI will not reach out to solicit rooms. If you are contacted by a third party company regarding hotel reservations, please ignore it and delete the message to avoid fraudulent scams. Fees include tuition, seminar materials, certificate of completion, continental breakfast, and lunch. Government employees will be eligible for special discounted government rates available in 2018. Employees must register online and indicate the registration as Government. Registrants will be asked to provide their government ID onsite. If attendee does not provide government ID, they will be charged the regular pricing fee. Any organization registering a group of at least 3 individuals to a specific SeminarsWorld location is eligible to send one additional registrant to a seminar at the same location at no cost.Group discounts apply to the same SeminarsWorld session and location at the same pricing. Next articleSeminarsWorld in Washington, D.C.